Glögg (or glögi in Finnish) is a Scandinavian mulled wine made with red wine or red fruit juices, heated up along with sugar and spices  cinnamon, cloves, cardamom, orange peel, allspice, mace, nutmeg, etc  and served mixed with raisins and almonds. At Christmas time ready-made, non-alcoholic glögg is sold in every store and alcoholic glögg in liquor stores here in Finland. "White" glöggs made with white wine, cider, white grape, apple, pear, or other light fruit juices are also popular nowadays. Glögg may be served as a welcome drink, before a meal, or after dinner, accompanied with sweet or savoury snacks or cocktail bites. Scald the almonds and peel them. If you cannot find dried Seville orange peel, substitute it with a couple of thin strips of the zest of a fresh regular orange  preferably use organically grown fruit. Pour the wine and the juice(s) in a saucepan and heat the mixture up. Do not let it boil. Add some sugar and the spices, mix thoroughly until the sugar has dissolved and let steep on a low heat for 5 - 10 minutes (or longer) without boiling. Strain the glögg and spike it up with a dash of vodka, if you like. Reheat the mixture, if necessary. 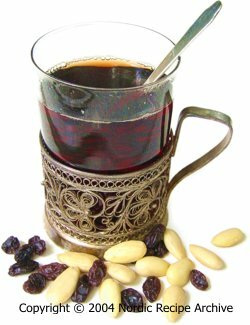 Drop a few blanched almonds and raisins in serving mugs or tea-glasses with a spoon in them and pour the hot glögg over. Serve immediately with eg star-shaped Christmas pastries or gingerbread cookies. See recipes for white Christmas glögg and non-alcoholic glögg. Recipe source: family recipe/traditional Nordic recipe.